Pandanet AGA City League Registration – Two Weeks Left! Do you want to play against the strongest players in the US and Canada? Six Professionals and many more of the top players will play monthly from November to May in the Pandanet AGA City League. Check our updated rules page for full information and dates of play. Contact TD Steve Colburn to register. A surprise walk-in Saturday morning may be all that stands between Mark Lee 7d and his fourth consecutive Cotsen Open title. 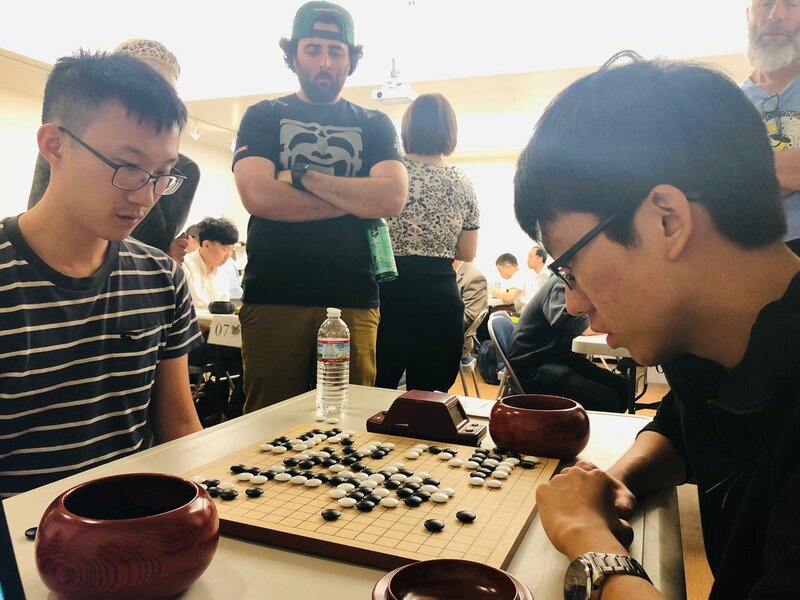 Andy Liu, the East Coast-based 1P, decided to make the trek to Los Angeles with some friends, and, like Lee (right, relaxing between rounds), was 3-0 at the end of a long day that started 90 minutes late due to delays following Friday night’s downpour and pairing issues. 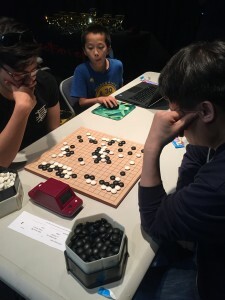 Neither top player had any trouble dispatching their opponents, however, and the clash of titans could occur as soon as Round 4 Sunday morning, set for 10:30, and, failing that, almost certainly the final round, unless one of the other strong players manages to pull off an upset. Despite the delays and overcast skies, the 155-strong field was in good spirits, enjoying casual games and of course the free Korean tacos from the Kogi food truck as well as free shoulder massages throughout the day. 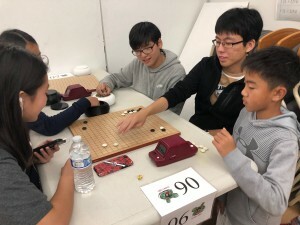 Tournament founder Eric Cotsen personally greeted each player as they waited on line to register and explained his mysterious Cotsen Go Tournament poster. Local go fans who are early risers can check out the pro-pro game Sunday morning starting at 8a at the Korean Cultural Center, featuring Yilun Yang 7P. 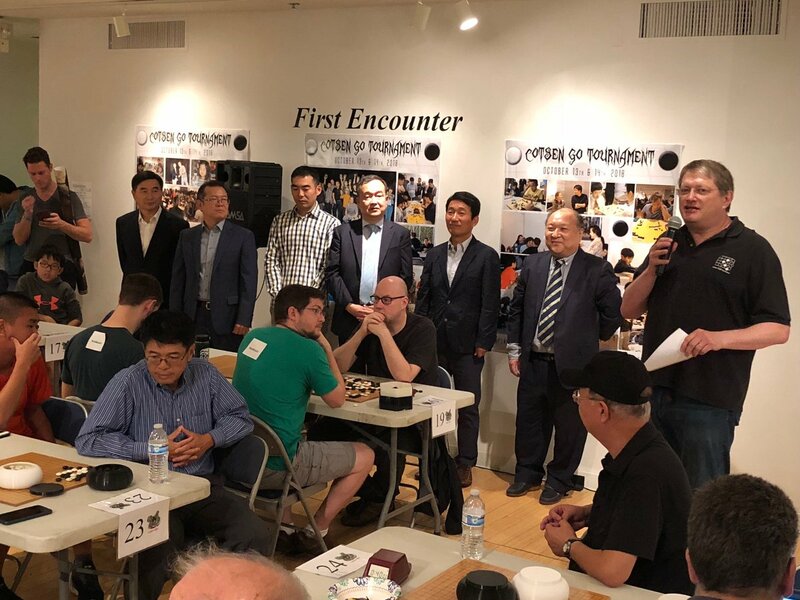 The day began with a visit by visiting Korean dignitaries (left), who welcomed the assembled go players to the Korean Cultural Center, which has hosted the annual Cotsen Open for a number of years now. On hand were Kim Wan-joon, Consul General of Korea in Los Angeles, Kim Nakjung, Director of the KCCLA, Oh Seung Keol, President of the Korean Education Center, Los Angeles, Sen Neung-uk 9P, Na Jong Hoon 8P and Ahn Dal Hoon 9P. 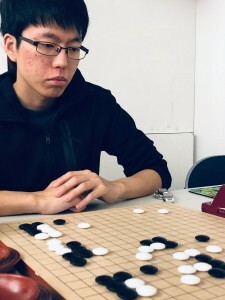 Looking to collect his fourth consecutive Cotsen Open title, Mark Lee 7d is facing a tough field of strong players this year, including Andrew Lu 7d, Bowen Zhang 7d, Hoon Jo 6d, William Lee 6d, Bo Luan 6d, Yi Wang 6d, Yixian Zhou 6d and Shengjie Zhou 6d. Registration for the 2-day tournament October 13-14 is already at 155, with players from 30 kyu to 7 dan, and walk-ins Saturday morning will be permitted: all players who want to play in the first round must be on line to sign in or register by 9:15a on Saturday. 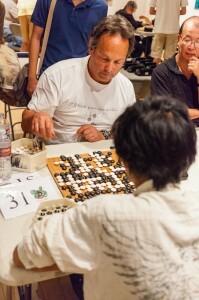 The tournament is held at the Korean Cultural Center (5505 Wilshire Blvd). Any questions, email cotsenopen@gmail.com. 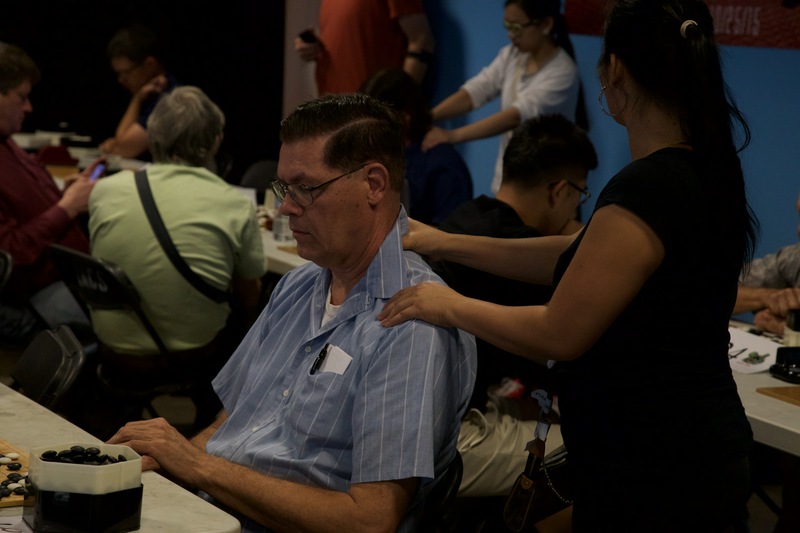 In addition to two days of competition, the Cotsen features free food truck lunches both days, roving masseuses and a pro-pro game Sunday morning. Follow the Board 1 action via the E-Journal on KGS and photos and news on AGA social media @thegaga on Twitter and @AmericanGoAssociation on Facebook. 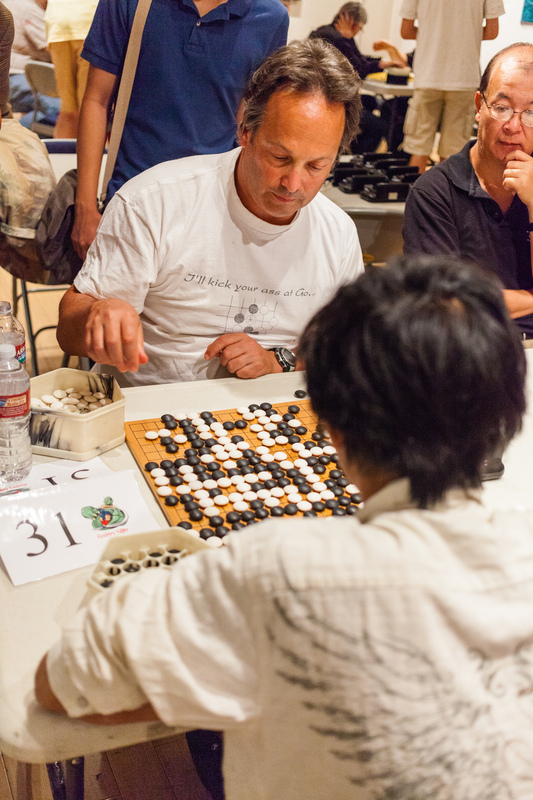 Registration for the upcoming Cotsen Open closes on October 9th; click here now to register. The tournament is October 13-14 at the Korean Cultural Center in Los Angeles. In addition to the usual free shoulder massages, Kogi BBQ is catering both Saturday and Sunday; free lunch for all pre-registered attendees. Three Korean professionals — Dalhoon Ahn 9P, Seo Nungwuk 9P, and Na Jonghoon 8P — will be on hand for simul games on Saturday. “We will be streaming Hikaru No Go on the 3rd floor for anyone who wants to watch,” says TD Christopher Saenz. 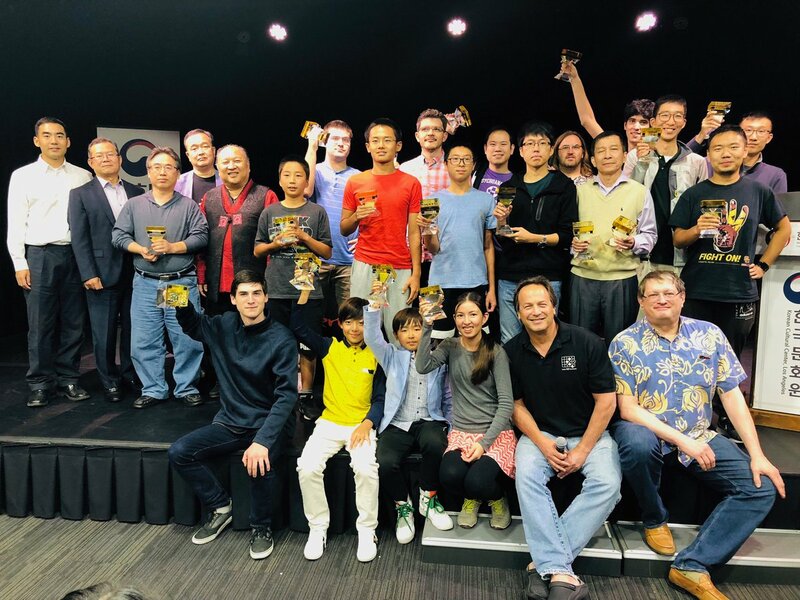 Volunteers wanted for set-up, registration, game recording and post-tourney takedown; volunteers get a special dinner invitation and game recorders get E-Journal caps. Email cotsenopen@gmail.com ASAP if interested. Pandanet AGA City League registration continues. Join some of the strongest players in the US and Canada in competing throughout the year. Compete for $14,000 in prizes in the multiple leagues. This tournament will run from November to May. Check the rules for full tournament details . Any questions contact TD Steve Colburn. Show off your city’s strength this year! It could be your team joining us for the finals at the US Go Congress next year in Madison, Wisconsin. 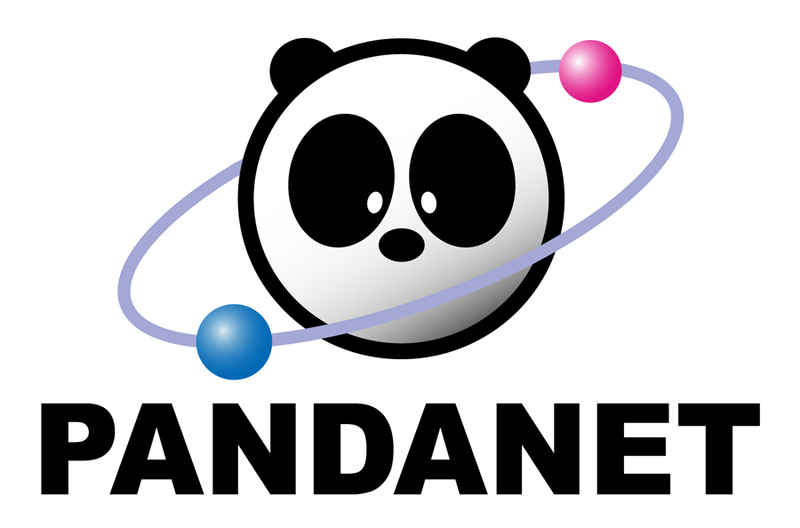 Registration is now open for the 7th year of the Pandanet AGA City League. Registration will be open until November 1st. Teams can check for the updated rules for full information. We hope to see many strong teams compete against the strongest players in the country. Contact TD Steve Colburn to register. What’s the fastest way to the top boards at the upcoming Cotsen Open? Volunteer as a game recorder! No previous experience necessary but you do need a laptop with KGS on it and must be available all day Saturday and/or Sunday, October 13/14 at the Korean Cultural Center in Los Angeles. Free E-Journal caps and lunch for all game recorders, plus credit in all our coverage. Email journal@usgo.org ASAP if interested. 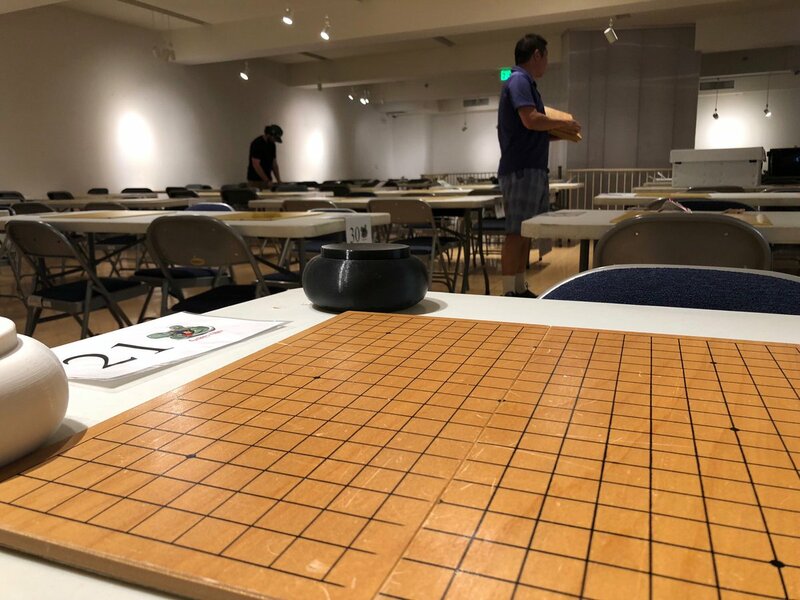 The website for the 2018 Cotsen Open is back up. The tournament is on October 13th-14th; pre-registration will close on Tuesday, October 9th, at 11:59pm. Day-of registration will also be available for $25. Pre-registration comes with benefits, including $20 entry fee and free food truck lunch on both days. As always, everyone who pre-registers and plays in all 5 of their matches has their full entry fee refunded. Also on tap: the Kogi food truck both Saturday and Sunday and Yilun Yang will do his pro game on Sunday.